BCHS has a small, dedicated staff that oversees the daily operations of our animal shelter. 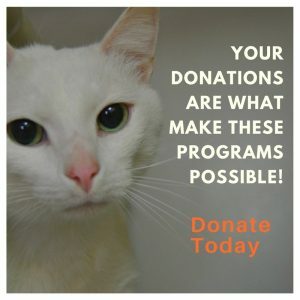 We rely on our volunteers, who donate many talents, to help us provide the best care for the animals entrusted to us, to assist with our programs, to spread awareness of our mission, and to raise funds to support our organization. Volunteers at the shelter must be at least 15 years old (18 years old for dog walkers). The following roles require a commitment of the same day of the week every week (or every/other week) for at least 3 months. For example, every Tuesday afternoon or every/other Tuesday afternoon. Dog Walker – Dog walkers are scheduled in the afternoons between 12-5, and shifts last at least 2 hours. Because we are a smaller shelter, dog walkers need to be physically comfortable handling most breeds and sizes of dogs. Volunteers need to commit to a weekly or every/other week shift on the same day. Cat Care – Cat care volunteers are scheduled in the mornings from 9-12. Volunteers help staff clean the cat condos, provide fresh food/water/litter, and get the cat rooms ready for when the shelter opens at noon. Volunteers need to commit to a weekly or every/other week shift on the same day. Shelter Assistant – Volunteers come to the shelter weekly or every/other week between 12-5 for at least 2 hours to assist with various tasks around the shelter. This may involve doing laundry, greeting visitors, washing dishes, cleaning, making adoption packets, or whatever else the staff needs help with. Cat Biography Writer – spend time with the new cats at the shelter and write biographies for use on PetFinder and other adoption sites. Handy-person – Volunteer a few hours a week to help with various repairs and maintenance projects around the shelter. Hours are very flexible, but a commitment of a few hours each week is needed. Special events volunteer – Check our events page for upcoming dates. Offsite adoptions – help with monthly adoption days at the PetSmart in Greenwood. Marketing – be part of our marketing team, helping with writing, outreach events, photography, graphic design, and more. Special projects – join our list of volunteers who come to help on random special projects as needed. Everything from painting to landscaping, to heavy lifting. We’ll contact you when we have a need, you let us know if you’re available. Volunteering is an amazing life experience I’ll never forget. Knowing the animal I helped may not have ever had a chance without me. I wish I could describe the feeling I get when I wave an animal I loved goodbye as its new adopters take it away. The friends I’ve made (furry or fellow human) have been unforgettable, the memories I’ve shared with them I hope I remember my whole life.